Wednesday, May 9, 2018 at 6:00 p.m.
Hutchinson Center, 80 Belmont Ave.
We would like to start off by thanking the people of Belfast and the region for their engagement and concern for the well-being of their community. We fully understand that a large economic development project brings with it many questions and implications for the community. We intend to continue to address those questions and concerns through this newsletter, public information meetings, and an ongoing dialogue with community members. We believe and appreciate that your input will help us develop the best project for us and for Belfast. We are grateful to the Belfast City Council for unanimously approving the zoning change on April 17th. This is an important first step that enables us to move ahead to submit applications to the City of Belfast Planning Board and to the various state and federal agencies. These applications will mirror information that we have been sharing with the community and additional information we will be communicating to the community in the coming weeks. They will be subject to public hearings and comment periods that will provide further opportunities for public input. Three months have passed since we reached an agreement to purchase land in Belfast. We have needed to conduct studies to obtain information and data before verified solutions can be presented to the public. We have been using this information to determine if the site meets our required conditions and how our operation can best be adapted to the site, while ensuring compliance with U.S. laws and regulations. 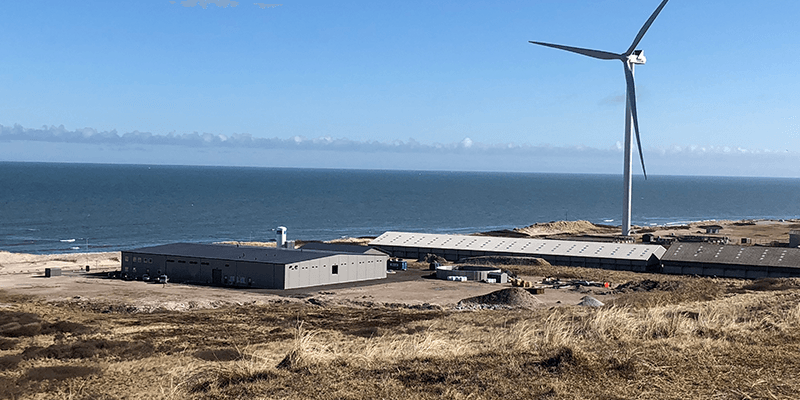 These assessments also have been important in providing verifiable data regarding the environmental impact of the project and defining the local environmental measures that may be needed. Since we are building our brand on sustainability, this is a high priority for our company. We have needed to obtain facts before we could go public with details. At this time, we have higher confidence related to many issues, and are thus in a position to share more details, both in this newsletter and at our next information on May 9th. We expect to have most remaining clarifications in place by the May 9th meeting. We now have much of the information we need to be able to finalize site and building plans. The illustration at the top of this newsletter is a preview of one of the visual profiles under consideration for the buildings. They are being developed with Scandinavian designs that reflect their surroundings to minimize visual impact. These designs have been used in Norway with great success. An alternative low impact design will be presented at the May 9th meeting, along with a number of site plans and renderings. We will maintain a green buffer around the facility. 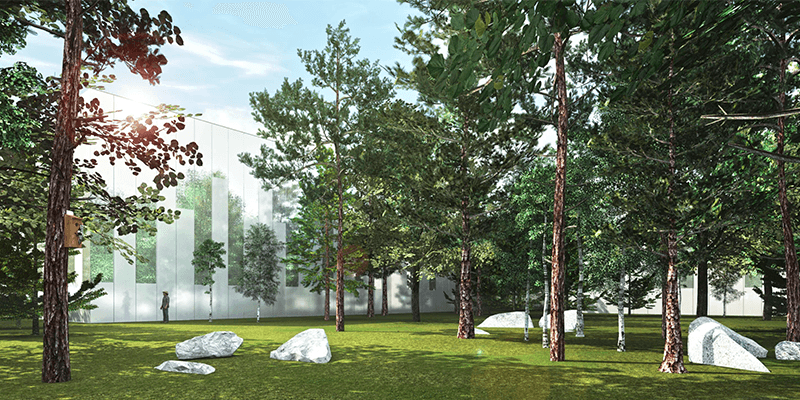 The trees that currently exist on the site, which are generally 10-15 feet higher than the buildings that we plan to construct, will provide considerable visual buffering. We will use low impact façades, as illustrated in the image above. These are currently undergoing final assessment. Complete renderings of the site and the facility will be presented at the May 9th meeting. We hope that all interested persons will come to this meeting. We have come to understand just how much the lower dam and the Belfast Water District office building mean to the people of Belfast and the surrounding communities. We have considered the view and the natural beauty that these landmarks provide, and we have chosen to preserve both the dam and the building. We have also concluded that our branding of a Belfast Atlantic salmon product may benefit greatly from building upon this heritage. When branding and labeling a product, it is important to be able tell a story, and we propose to the community that our salmon story and labeling should build upon these local landmarks. Therefore, the community can be assured that both the dam and the building will not only be preserved but will also be an important part of our highest-quality Atlantic salmon brand. 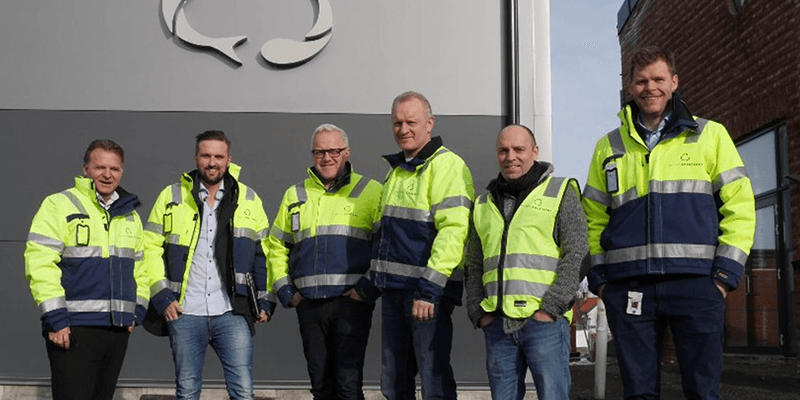 Nordic Aquafarms has been visited in Norway and in Denmark by a number of Maine companies, including Cianbro of Pittsfield, Ransom Consulting and Rambøll of Portland. We believe all of these companies will attest to the quality development work we are doing, and the quality of staff we have on our development team. 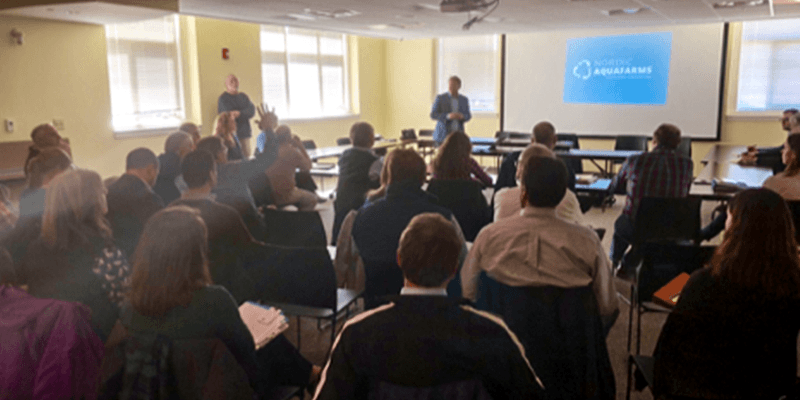 We believe our Maine partners have gained from these visits a much greater understanding of who we are and what we do, and we look forward to introducing more members of our team to the community as we move forward. Our company was founded by experienced fish people, finance professionals, and engineers. We have over 50 years of practical fish farming experience within our management staff, and over 20 years of land-based farming experience. We are a trailblazer in the relatively young land-based fish farming industry and we are supported by strong and well-established financial investors in Norway. Both of the companies Fredrikstad Seafoods and Nordic Aquafarms were founded by Erik Heim, a leader in the commercial development of land-based farming in Europe. He is overseeing the expansion of Nordic Aquafarms in the U.S, and as a U.S. citizen he has equal concern for the company´s activities in Maine. Our organization has grown rapidly, with 28 employees now in the Nordic team, along with an experienced board in Norway. It all starts with the people, and we are proud to have built a word-class team, one that will grow with another 15 people during the next year. Our story is one of developing incrementally, step-by-step. We have gone from putting our first farm into operation with brood stock fish 3 years ago, to developing a full-scale hatchery operation, to putting the world´s largest Yellowtail Kingfish facility into operation 1 year ago, to now currently constructing Europe´s largest land-based Atlantic salmon facility in Norway. 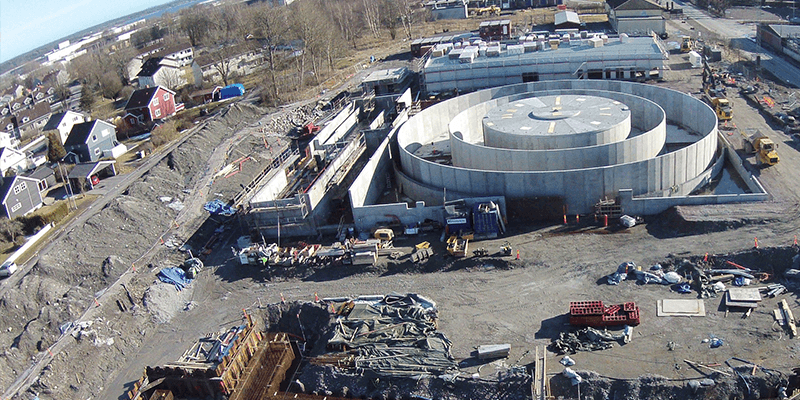 The second phase of construction for this facility in Norway, which will begin this year, will provide the models for the grow-out and smolt facilities that would be built in Belfast. Thus the construction and design of the Belfast facility will be quality-assured in Norway 1 year ahead of progress in Belfast. By the time we go into production in Maine, we will have been in phase 1 salmon production in Norway for over 2 years and in Yellowtail Kingfish production for 5 years. While land-based production is still a maturing industry, Nordic Aquafarms has come a long way in understanding these projects, having acquired significant experience and know-how in the Nordics, and is now able to substantially reduce the level of risk in them. The project in Belfast (and its scale) represents the next logical and natural step in Nordic Aquafarms’ development. Water, especially freshwater, is a valuable resource. Nordic Aquafarms has from the very start of this project made a promise to only move forward in Belfast if it can confirm a sustainable rate of withdrawal. The Belfast site is very promising because it is located at the very end of a larger watershed, just before it empties out into the ocean, meaning that water that otherwise would never be used, can be utilized for a productive use and can help to create jobs and tax revenue for Belfast. Based on test wells, we now believe that up to 1,200 gallons of freshwater per minute can be sustainably withdrawn from future production wells located on the site. Modeling results based on our test wells will evaluate and conclude on long-term sustainability (meaning that future withdrawals will not adversely affect groundwater conditions on the site or beyond the site). These results are due soon and they will be presented in full at the May 9th meeting. We are committed to rigorous assessments, as Nordic Aquafarms’ investments are also dependent on a long-term sustainable freshwater withdrawal rate. 1,200 gallons of freshwater per minute is a withdrawal rate that is quite similar to other existing commercial activities located on the coast of Maine. Water quality testing that was overseen by Ransom Consulting has demonstrated that the groundwater on the property is clean and well-suited for Atlantic salmon. 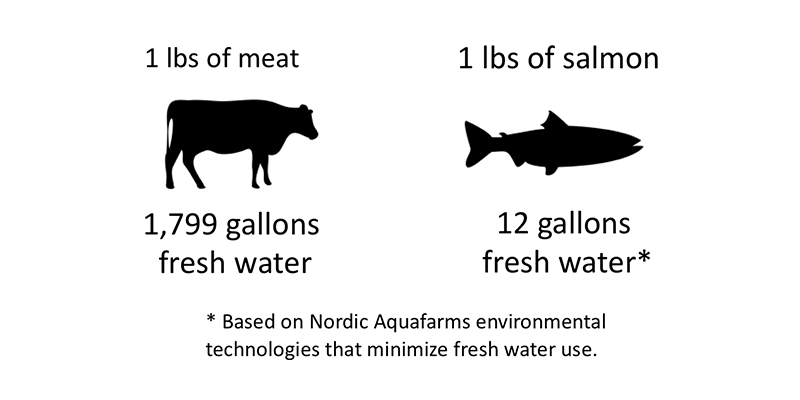 Nordic Aquafarms has a policy of not utilizing water sources that may contain pollution, even if contaminants can be removed from that source. In addition to this, excess water delivery capacity from the Belfast Water District will be used in the operation, according to agreed-upon commercial terms. Nordic Aquafarms is implementing a number of environmental technologies to enable a large-scale aquaculture operation. These technologies further conserve water, and thus enable us to use less water per pound of fish than what is used by most existing land-based facilities. To put things into perspective, an estimated 1,799 gallons of water are needed to produce a single pound of beef (https://foodtank.com/news/2013/12/why-meat-eats-resources/). (Figures do vary a bit depending on location, type of cattle, and source.) Using the freshwater volume specified above, only 400,000 pounds of beef could be produced in Belfast, versus 60,000,000 pounds of Atlantic salmon, as we are targeting. In the case of Atlantic salmon, freshwater consumption is also reduced as significant amounts of seawater are used in the production process. * Based on Nordic Aquafarms environmental technologies that minimize fresh water use. Based on the data obtained from site exploration, we are now in a position to correctly size the facility, and to also communicate verified discharge information. 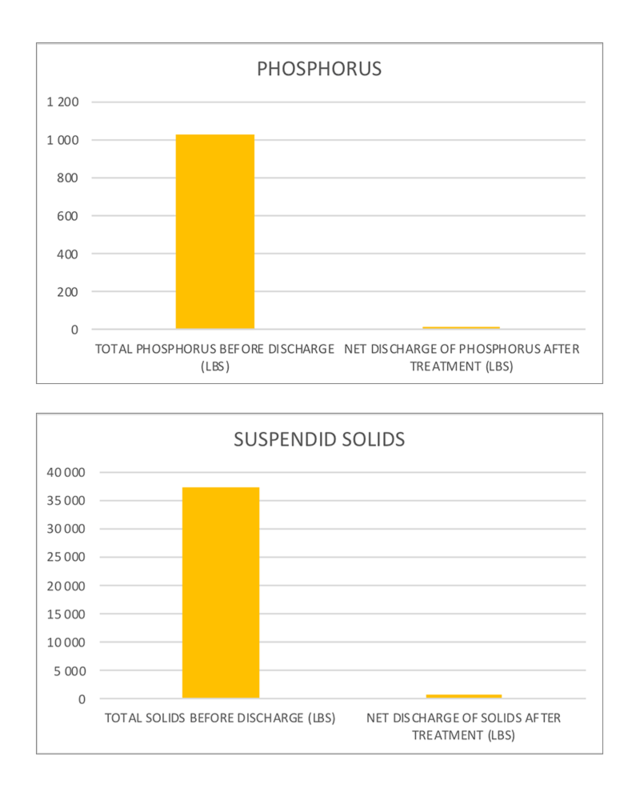 Gross discharge is generally a product of fish feed volumes and resulting residual nutrients, while net discharge is a product of applied water treatment technologies. It is up to the individual producer and authorities to determine level of treatment. We have applied the most stringent standards. The net discharge, after water treatment, will be significantly lower than the region’s agricultural run-off, and it will be lower than other discharge permits that have been previously granted in the area. And most significantly, this discharge will be released a mile off of the shoreline, to be mixed and reduced within large volumes of ocean water. There is no other existing large facility in the world that has such combined measures in place. Discharge levels are subject to Maine DEP and U.S. Army Corps of Engineers approval. Detailed documentation will be provided for the permitting process. In addition, anti-pathogen treatment technologies will be implemented to maintain high levels of biosecurity. We don´t want any bugs coming in or out of this facility. Finally, as sea lice cannot enter through our intake systems, we do not use any medicine, including antibiotics, against these or against any other parasites. The use of antibiotics was discontinued in Norway many years ago and they will not be used in Belfast. In terms of protein efficiency (that is, how many pounds of feed does it take to produce 1 pound of protein), fish farming is the most efficient type of animal farming. It takes only 1 pound of feed to produce 1 pound of fish. Fish are by far the most energy- and protein-efficient livestock animal to farm. Regarding the specific fish feed to be used in the Belfast facility, Nordic Aquafarms is more than a year away from sourcing any feed. However, we can say that it will be sourced from the region and that it will not contain any genetically-modified-organism (GMO)-based ingredients. It should be noted that currently there does not exist an organic standard in the U.S. for farmed fish, but Nordic Aquafarms plans to contribute its expertise in the development of such a standard, and to further consider the use of organic feeds. Both non-GMO and organic feeds are available in Maine, and we also have the option of influencing the specific feed formulas that would be used in Belfast. Meanwhile, considerable research and development related to fish feed is taking place, and we are excited to see what breakthroughs arise over the next couple of years. Nordic Aquafarms is collaborating with leading scientific communities in Norway regarding fish feed. Nordic Aquafarms has no plans to engage in any in-house feed production, as we want to keep our focus on producing quality fish. We instead plan to work with the quality suppliers that already exist in the New England region. 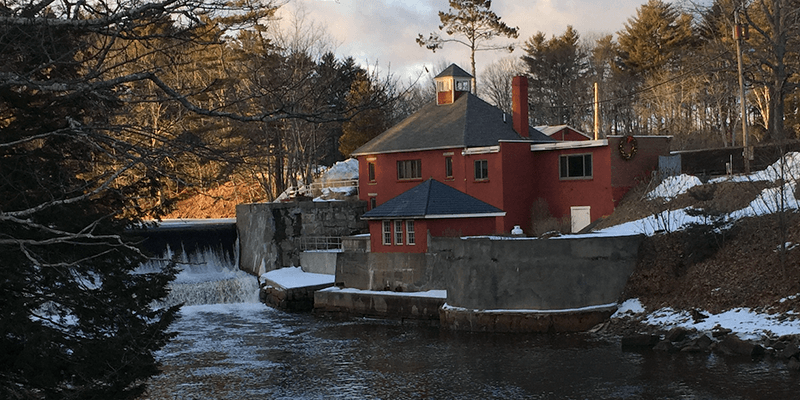 Nordic Aquafarms has considered both brownfield sites (previously developed sites) and greenfield sites (previously undeveloped sites) throughout New England. One of our principal decision criteria that have guided us is that clean water and natural surroundings create good associations with a natural healthy product. One of the strong points of the Belfast site is the verified year-round availability of clean water and the lack of historical pollution on the site. At the same time, we recognize the need for responsible stewardship when constructing on a greenfield site. Given the fact that this site has been logged on a regular basis and continues to provide valuable environmental services, we will preserve the green profile of the area and ensure continued recreational uses along the dam. 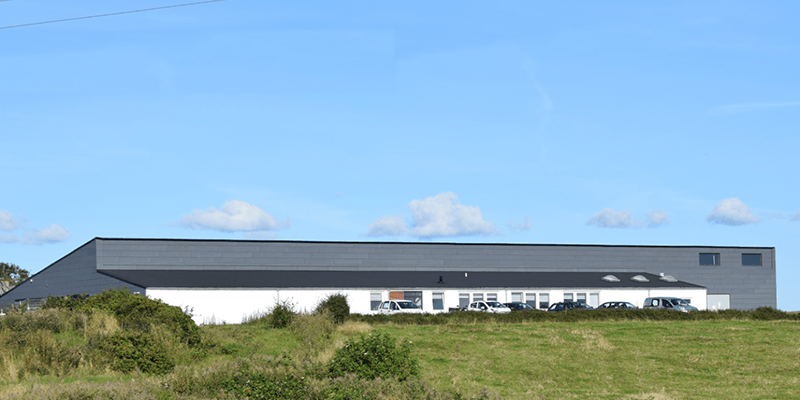 As things move forward, Nordic Aquafarms will be increasing its engagement and presence in Belfast. We hope this will enable more frequent contact with people in Belfast who have questions or input. In addition to putting our own people on the ground in Belfast during the coming months, representatives from our Maine-based partners will also be available. An informational meeting with all state and federal agencies that will be reviewing the Belfast project was conducted in April in Augusta. This was a very useful meeting for us as well as for the agencies that were present. We exchanged questions and shared information in anticipation of our permit filings. We were encouraged by the tone of the meeting and by the feedback we received. Permitting with the various federal, state and city authorities will start in May, and this process is likely to run through the remainder of the year. During this process, we encourage citizens to continue to provide input that is relevant to the project. Nordic Aquafarms will carefully review potential amendments to our plans in accordance with the feedback we receive. When permits hopefully are acquired, the initial stage of development could start in about 1 year with the construction of a hatchery (the first step in the production stage). We appreciate both the concerns we have heard as well as the many encouraging and supportive messages we have received from area residents. We will do our very best to continue to keep the community updated on our progress. Meanwhile, we encourage you to contact us if we can be helpful in answering your questions. We can be reached at post@nordicaquafarms.com. For more information also see our latest interview in Belfast: https://vimeo.com/264158285.